Leeds United are edging closer to making a long-awaited return to the Premier League, with Marcelo Bielsa’s side three points clear of Sheffield United with just four games remaining of the season. There’s certainly a feel-good factor around the club at this moment in time, and that is evident with one Leeds player mocking another. 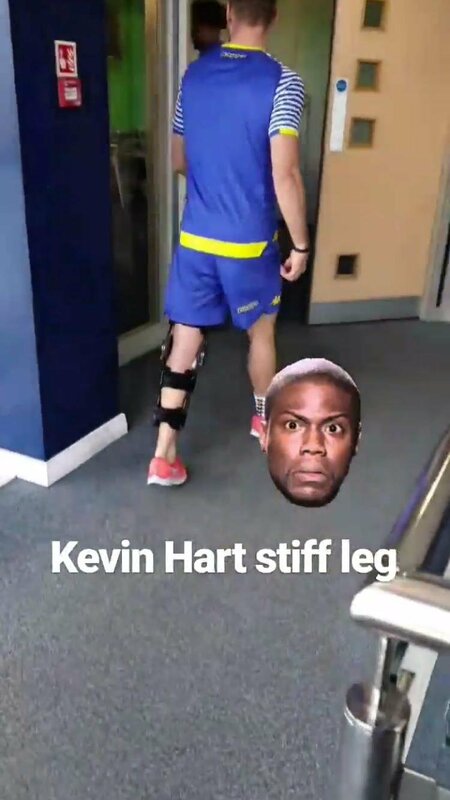 Kemar Roofe has hilariously ripped into Leeds team-mate, Barry Douglas in a post on his Instagram story today, as footage emerged from the club’s training ground. Douglas has been ruled out of action for the remainder of this year’s campaign with a knee injury that he picked up in a win over Millwall earlier this year. The full-back has struggled for consistent game time this season, which is largely down to the fact that Ezgjan Alioski has hardly put a foot wrong at left-back. But Douglas will be hoping that his Leeds team-mates can finish what they started by returning back to the top-flight after a lengthy spell away. Marcelo Bielsa’s side are next in action when they host relegation-threatened, Wigan in a game where the Whites will be expected to pick up three points to help aid their promotion bid. It’s good to see the mood around the club is a good one ahead of the promotion run-in. If you’re challenging for promotion, then you need that and it’s good to see that the success on the pitch is seeing the players in high spirits whilst in training. I can’t see anyone stopping Leeds this season and promotion is their’s to lose.